Today, the average life span in developed countries is almost eighty years. If human life spans depend on our genetics, then medicine has got the upper hand. We are, in a way, freaks living well beyond our appointed time. So when we study aging what we are trying to understand is not so much a natural process as an unnatural one. Inheritance has surprisingly little influence on longevity. James Vaupel, of the Max Planck Institute for Demographic Research, in Rostock, Germany, notes that only six per cent of how long you’ll live, compared with the average, is explained by your parents’ longevity; by contrast, up to ninety per cent of how tall you are, compared with the average, is explained by your parents’ height. Even genetically identical twins vary widely in life span: the typical gap is more than fifteen years. "Earlier this month, he dubbed former US vice-president and 2000 Democratic presidential candidate Al Gore 'a gross alarmist' for making the Oscar-winning documentary, An Inconvenient Truth, which helped focus media attention on global warming." A promising new blog from the WSJ. "The San Jose, Calif., company is releasing its Adobe Flex source code to the open-source community to enable developers throughout the world to tap the capabilities of Flex and participate in the ongoing development of the technology." It must be open season again for the Microsoft advertising budget. All that fawning that mainstream tech media is doing over Vista. Nauseating really. I agree with the early posts that this was not a particularly fair comparison (I've seen much worse though). I have a single machine here at home that still has Windows on it. Several others are either Apple's OS X or pure Linux. I had to boot into Windows for the first time last night to try out some software for a friend, and letting it boot into Linux first (by mistake) I was reminded that it had been 380+ days since the machine was last used. I guess I can safely say that I'm no longer a Windows user. That doesn't stop me from getting regular phone calls from people who still do use Windows and are "stuck". In the race to get to technology that "just works" Linux has come a long way, and I think you have to give the edge to OS X not Windows when it comes to commercial software. the problem with Windows though is that it suffers from a syndrome known as "it worked yesterday". No matter how experienced or careful a Windows user is, his Windows installation will degrade over time, getting slower, less reliable and eventually reaching a point where components no longer work at all. Citing the Windows Registry as an advantage most particularly demonstrates that this article is biased, as it is the complexity and undocumented nature of the Registry that causes most Windows problems. Turn a novice user (which this article seems to be aimed at) loose with the registry editor for a few hours and see if you don't have to do a fresh install. In my case, I had a "small" 4 gig partition for my Windows 2000 "legacy" system. Since I had not booted it in so long I decided to get fresh anti-virus, Windows updates, etc before running the test that was my ultimate goal. Before doing all of this about two thirds of that partition were used with software alone, no applications other than the Mozilla browser and AVG anti-virus. After running the Windows update however, the partition is almost full. That's 4G, for Windows and two relatively small applications. One has to wonder what Microsoft is doing with all that space. I'm sure glad I don't use Windows any more. Hopefully more of my friends will be jumping ship soon. "I aim my columns at mainstream users doing typical tasks who have little or no technical knowledge, no help from experts, and no appetite for becoming techies. These folks want the computer to do things for them. They don't want to have to do much, if any, configuring of, or maintaining of, their computers. They have no patience for geeky procedures. For instance, when they buy a peripheral device, they expect to plug it in and find that it works, often without even installing the CD from the box." So far so good. Typical PC users are not geeks and don't want to be. They are as lazy when it comes to maintaining their computers as I am when it comes to doing my own plumbing. And yes, the Apple computer and OS provide a pretty good end-user experience. I recently helped a new Apple user who had use the old OS, but never OS X. I helped them via e-mail. No phone call or personal visits were necessary. They seem to be doing just fine. But by what measurement does Windows come out ahead of Linux in this regard? I recently installed the latest version of Debian (which does not have the best reputation for ease of installation). Just as I started the process the phone rang and it was a friend who happened to be telling me about his travails installing a new machine with XP (he wisely avoided Vista). The Debian installer (that I use) asks a few questions and then downloads the components of the OS that you have requested. This can take some time so I went over to the couch to talk on the phone while the download took place. An hour later my downloads were done, and I think I had to tell the install program what country I was in and what language I wanted to use, but in every case my "answer" was to hit enter because USA and American English are I think the defaults for just about everything. I had to set my timezone. I had to pick a userid for myself and set two passwords, one for normal use and one for administrative activities. That was it! The system rebooted and presented me with a graphical login screen. I logged in and was soon doing normal userland activities. I did some tests. I plugged my camera in. It just worked! I had a scanner, two external disk drives, all of which normally are plugged in as USB devices. They just worked! I also have a USB printer, but it is a Samsung, not an HP. I had to install a driver for that (5-10 minutes). There are some "applications" that I like to have that are not a part of the standard install process, like a utility to set the correct time on my computers clock at boot time. I install these things with a GUI interface whenever I feel the need, and usually the entire process takes a couple of minutes (and almost never requires a re-boot). I spend FAR more time helping people fix their Windows machines than I spend working on my several Linux (and an OS X) systems. When their demands become too frequent, I start stalling in hopes they will find some other geeky friend or relative to pick on. I'm not about too install Linux on one of these people's machines unless they ask me to, but of course they aren't going to ask me to if they have never heard of it, and if they are going to hear of it, it's much more likely that they will hear of it from a journalist such as yourself, since most such people aren't browsing "Linux Journal" on a regular basis. I'm glad you at least mention it from time to time. Maybe in the future you could not refer to it as harder to use than Windows, which rightfully scares the bejeesus out of most people, for whom installing ANY operating system is thought to be something just south of brain surgery in order of complexity. ps: Now to be honest, most of the "it just works" claims about Linux (particularly Debian) were not true until relatively recently. But most of that has been true about Suse for a while and Ubuntu (and possibly others, but those are the ones I've tried) for at least a couple of years. As far as I know, from my own experiences and those of others I talk to, "it just works" is not a phrase that frequently applies to Windows. More importantly, with Windows the phrase "It worked yesterday" is quite common. Even on those occasions when a new toy can be "just plugged in" and work, there is a good chance that some future update to Windows, or a subsequent new toy, or a virus, or spyware, and so on, will cause things to stop working. Often with disastrous side effects. This is most definitely NOT the case with Linux. It would probably be much more accurate for you to simply say that you talk most about Windows because that is what most of your readers already have, and just leave it at that. Hopefully the future will hold better prospects for the computer as an appliance, and there is a good chance that appliance will be running Linux. "With IBM's involvement in Second Life, I wouldn't be surprised if the next major version of Linden Lab's virtual world was built atop the 'gameframe' platform. That might solve many of the crippling technical limitations the current platform suffers from, such as the inability to stuff more than several dozen avatars into the same space. There's even a glimmer of hope for a smaller environmental footprint, as Gelardi stressed to 3pointD 'the mainframe architecture should make running virtual worlds more energy-efficient.'" "The Washington, D.C., company is best known for high-end audio brands such as Harman Kardon, JBL and Infinity. In recent years the 54-year-old company has expanded into audio, video and navigation systems for luxury cars such as BMW and Mercedes." "So why would a developing country want to pay $3 per PC when it can get a much better deal for free? The real cost of Microsoft’s $3 offer to developing countries is much higher than its price tag suggests. The real cost is getting sucked into a proprietary world and the loss of choice that open source software would bring." "April 25, 2007 (IDG News Service) -- Stanford University's Folding@home distributed computing project has seen its capacity more than double in the last month, thanks to the addition of idle processor cycles from hundreds of thousands of PlayStation 3 consoles." "Let's sum up. If the Spy Act become law, hardware, software, and network vendors will be granted carte blanche to use spyware themselves to police their customers' use of their products and services. Incredibly broad exceptions will probably allow even the worst of the adware outfits to operate with legal cover. State attempts to deal with the spyware problem will be pre-empted and enforcement left up almost entirely to the FTC. Gee, what's not to like in that deal?" Methinks this could end up being fun. Great weather today (a short burst of global warming I guess) so out to the beach I go while I await the fallout in the blogosphere. "Yahoo's first-quarter revenue was $1.67 billion, less than half Google's $3.66 billion. Google, once again, blew away Wall Street expectations, while financial analysts openly wondered how long Yahoo CEO Terry Semel would stay in the Internet company's corner office." Keep in mind all the speculation and rumor mongering on all of this is just that. parties are forbiden to disclose what went on in those negotiations, so in a sense, by listening to this stuff: Everything You Know is Wong! Is it just me or isn't it a little strange to have Microsoft legal in the form of Brad Smith calling around to journalists trying to sway public opinion on all of this? Don't they have other "departments" to do that sort of thing? Has anyone thought of the possibility that had Microsoft won the bidding then there most certainly WOULD have been an antitrust issue, and without any prompting from Google? Google is not a convicted monopolist, nor do they dominate search in the same way that Microsoft dominates the desktop. Microsoft would have done everyone a big favor, including their investors, had they voluntarily split the company into separate OS and Applications companies. Still not too late for that move either, but as Microsoft continues to lose mindshare the benefits diminish. Maybe Microsoft legal meddled a bit too much in the negotiations and now they have a guilty conscience, aka fear of the next re-org. After all, they DID lose the antitrust suit, it was only sloppy sentencing that got them off the hook. And now with everyone re-evaluating DRM, MS selling copies of Windows for $3 there isn't much for MS legal to do other than work out cross licensing issues for patents. Must be hell. Google promises not to lock users data into their products. To me, that has become the number one feature of any software I use. While there is always reason to be skeptical when a vendor makes such a promise, we don't have to be skeptical if Microsoft were to make such a promise (which they haven't to my knowledge), we only have to look at their history: With almost every product, with every press release, with every membership on any standards body Microsoft's goal even beyond a desire to have the best products is to make it difficult if not impossible to use competing products side by side with monoliths such as Office and Exchange. As someone already pointed out, I doubt that the sellers in this case really care what Microsoft's evil intent might have been, but the US Justice department might have, and that would have held up them getting their money. There is relatively little merit in challenging the Google buy however, so this sale will sail (hehe) through by comparison to what would have happened if MS had won the bidding. Courtesy of Homestarrunner and Strongbad. Posted via IceWeasel on Debian 4.0. Well, I think I've gotten as much out of Windows Vista as I can (having never used it). But for those who are forced to, this might be a handy site. I think they should call it "That Damn OS" though. PCs in general, even Intel ones, aren't all that bad. "Akerlof illustrated his ideas with a used car market. A used car market includes both good cars and lousy ones (lemons). The seller knows which is which, but the buyer can't tell the difference -- at least until he's made his purchase. I'll spare you the math, but what ends up happening is that the buyer bases his purchase price on the value of a used car of average quality. This means that the best cars don't get sold; their prices are too high. Which means that the owners of these best cars don't put their cars on the market. And then this starts spiraling. The removal of the good cars from the market reduces the average price buyers are willing to pay, and then the very good cars no longer sell, and disappear from the market. And then the good cars, and so on until only the lemons are left." So that's why everyone seems to continue using Windows! "The mysterious State Department e-mail appeared to be legitimate and included a Microsoft Word document with material from a congressional speech related to Asian diplomacy, Reid said. By opening the document, the employee activated hidden software commands establishing what Reid described as backdoor communications with the hackers. The technique exploited a previously unknown design flaw in Microsoft's Office software, Reid said. State Department officials worked with the Homeland Security Department and even the FBI to urge Microsoft to develop quickly a protective software patch, but the company did not offer the patch until Aug. 8 — roughly eight weeks after the break-in." If you prefer to get your information at a glance, we've added a recommendations tab that you can add to your personalized homepage. Simply click on "Add A Tab" on your Google Personalized Homepage, and type in "Recommendations" for the tab name (keep the "I'm feeling lucky" checkbox checked). We'll give you a page of recommendations that are updated daily. Note: It seems you have to go through the "Add A Tab" dialog for this to work. Just changing the name of an existing tab doesn't (seems like it should though). It also helps if you can spell "recommendations" properly! Hey Dude! Check Out Zude! "The Czechs are the latest converts with Prime Minister Mirek Topolánek's announcement last week that the personal income tax rate will fall to a flat 15% next year, replacing progressive rates of 12% to 32%. The corporate tax rate gradually drops to 19% in 2010 from the current 24%. If the Prime Minister manages to push his plans through a divided parliament in June, it would bring to 14 the number of single-rate tax systems in the world, all but four of them in Eastern Europe. (Hong Kong, Iceland, Mongolia and Kyrgyzstan are the exceptions.)" Pretty soon they'll be calling us commies! "Well, we tried to keep it a secret as long as we could, but to be honest, we've been dying to tell you about the bun we've got in the oven. 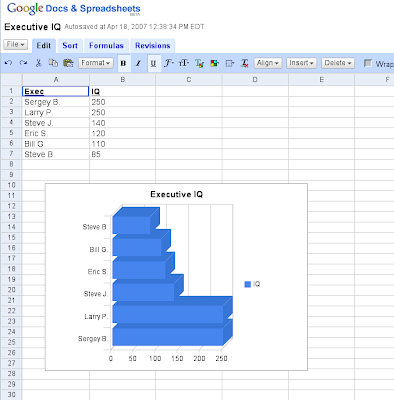 We'll soon be welcoming a new addition to the Google Docs & Spreadsheets family: presentations." One less reason to own Office. Rep. Homan and his son Doug tried to add their little open standards boost to SB 1974 as quietly as possible. They wanted the modified bill to at least get through its first committee approval before anyone spotted what they had done. But Microsoft's Florida lobbyists were on the ball and spotted it almost immediately. "Microsoft, of course, wants to eat its cake and have it, too, calling its vision 'software plus services,' a convenient reworking of the 'software as a service' phrase. That Microsoft has done a poor job of articulating that hybrid strategy is evidenced by the fact that even developers close to the company don't understand it. 'I'm trying to get my arms around this,' says Tim Huckaby, CEO of application development firm InterKnowlogy and a Microsoft MVP. 'If I can't understand, and it's my job to understand, then CIOs are going to have a devil of a thing with this.'" "The old playground taunt of 'it takes one to know one' seems especially apropos today as Microsoft and AT&T both raised antitrust questions about the proposed Google/DoubleClick merger." Another carry-about Linux device. The more the merrier. Hopefully such devices with (relatively) open source OS and utilities at their core will proliferate blocking the sort of hegemony that Microsoft has on the desktop. One thing that gets me about these futuristic scenarios though is that everyone is still rushing around in their cars, trying to do business when they should be focused on the road, not to mention the cartoon version of the road displayed on the device, err, AND listening to Beethoven! Are we repeating the error from last century of underestimating the need for face to face contact? Or over-estimating it: Why doesn't all this new technology save the need to make a trip at all (not to mention still relying on printed output)? So, in the future, some of us will still have to put in 10 hour days at the office, being prepared to "print out those reports" while the high-powered executive/glorified sales-rep stays at home to get in his morning jog, miss traffic and program his 200-inch TV set. I can hardly wait! * 1% of users participate a lot and account for most contributions: it can seem as if they don't have lives because they often post just minutes after whatever event they're commenting on occurs." I got here looking for information (I failed) on why Gmail POP services were down for many people for most of yesterday (the 11th) and there still isn't one single word from Google on the problem (which from some posting on their Groups message system may still be affecting some users). But no, not even an "We're looking into it" post, even though in the above group there is a specific place (thus far unused) for such things. I have a feeling this participatory thing has something to do with it, or maybe in reverse: Of a companies staff: 90% are tasked to interact with customers, but only 9% make a stab at it, and only 1% get it right. That one percent burns out pretty fast though and transfers to one of the back-room jobs if they are lucky. Is Google developing a reputation for being disconnected from its users? Aloof, to busy to respond, update status, admit mistakes? Chalk one up for that possibility. Nature designed us as carnivores, but what does nature know about nature? Meat has been designated a menace. Among the 51 exhortations in Time magazine's "global warming survival guide" (April 9), No. 22 says a BMW is less responsible than a Big Mac for "climate change," that conveniently imprecise name for our peril. This is because the world meat industry produces 18% of the world's greenhouse-gas emissions, more than transportation produces. Nitrous oxide in manure (warming effect: 296 times greater than that of carbon) and methane from animal flatulence (23 times greater) mean that "a 16-ounce T-bone is like a Hummer on a plate." Good article. Hard to pick a representative quote. The good news in all of this is consumers should expect the price of chips to continue to fall, which should lead to lower prices for servers and PCs. This trend is expected to be driven by the heated rivalry, as well as an expected oversupply of chips by the end of the year, when Intel is expected to have five manufacturing plants rolling out products, and AMD will have two. In addition, AMD has outsourced more manufacturing from Chartered Semiconductors. With the economy expected to slow, it's unlikely there will be enough buyers for all those chips, McGregor said. Microsoft's new Windows operating system isn't expected to significantly boost PC sales, and emerging countries in Asia and other regions, which are expected to be prime growth areas for servers and PCs, are more likely to favor low-end chips, which could help lower the price of high-end products. Well, I'm a fan of anything that isn't Intel. Not because I hate the company, or love AMD, but because I hate having only one vendor to chose from for anything. So there is never any bad news in struggles such as this as long as the smaller company doesn't get put out of business, or frozen out of access to markets by (what should be) illegal deals with Dell, etc. My guess is that eventually US companies like Intel and AMD will play a smaller role, possibly to the vanishing point, in micro-architecture. Inertia has kept us (no you) thinking that the central processor matters all that much. In fact, by making only tiny incremental changes to the xxxxxx86 instruction set, register configuration, etc., Intel has rendered itself less important as an "innovator" (ooooh I hate that word for some reason). AMD couldn't even exist if the "Intel standard" wasn't so stagnant. But it is, and nobody, at least nobody here in the US, seems to mind all that much. Microsoft props up Intel and Intel does its best to prop up Microsoft, though it would rather be free of this dependency I suspect. What we have here is not a healthy technical economy, but internationalization will eventually fix that. The details of this would be another page, so I'll leave it as an exercise. Suffice it to say there will be a variety of processor to chose from with names that we might not recognize, and in some cases, there will be dramatic differences in architecture covered over by reference-design version of Open Source Software. For applications written in some high level language like C (Java, etc) and using standard OS calls (for a standard Open OS that is), a recompile will make any such app run on any such device. Now that will be a healthy tech economy. Does Microsoft want to come out and play? Does Intel? They'd be foolish not to be thinking about it. Our country will be foolish to not be prepared for it. "I find it undefendable to say that the Clinton administration had no direct responsibility for the death of the SSC. I understand that the fans of the Democratic Party often like to imagine that their party is more supportive of science than the Republicans. But we just happen to have some evidence that it's not the case in high-energy physics. It's up to you what you do with this evidence." "On this view, the additional regulatory freight brought into play by the 2002 Sarbanes-Oxley Act should have been a godsend. By restoring the confidence in U.S. corporate governance that had been shaken by the Enron-era corporate scandals, America would assure its continued dominance of world capital markets well into the new millennium. Alas, things have not quite turned out that way. Whatever good might be said of Sarbanes-Oxley (and there isn't much good to be said for its intrusive, circulatory and duplicative grab-bag of rules), the statute has triggered a complete change in the way the world views the U.S. as a center for capital formation." "Rather than global warming, Gray believes a recent uptick in strong hurricanes is part of a multi-decade trend of alternating busy and slow periods related to ocean circulation patterns. Contrary to mainstream thinking, Gray believes ocean temperatures are going to drop in the next five to 10 years." "The volunteer run magazine continues to thrive while the magazine run by SSC has been closed down. In early 2006, SSC closed the web site at LinuxGazette.com and made it an HTTP redirect to the Linux Journal site." Time flies, and I never noticed this minor victory for ethical behavior, until just now, when I tried out both http://linuxgazette.com and http://linuxgazette.net and found only one still in existence. My reason for curiosity was the more recent demise of http://tuxmagazine.com/ of which I was a fairly regular reader. I just got an e-mail offering me("as a former TUX subscriber"),a discounted subscription to the paper edition of Linux Journal and some other goodies. I didn't do much to earn this offer. Tux magazine, available only online as a download was free, so my "support" of it consisted of downloading just about every issue, which was in plain ole PDF which I thought was a great idea for other print publications to learn from (and now I guess maybe they have learned that it doesn't always work). By the way, before the discontinuance of Tux they announced they were going to a paid format, but I guess they didn't get enough positive feedback to justify even that. I would have probably been willing to pay for it, but it never came down to that choice. I guess I'm not alone in having a growing lack of interest in print publications. I rarely actually pay for a technical publication since I mostly got them free. A long time ago people who did what I did for a living would willingly pay for Computer World and not need to read much else to know all you needed to know. Then came the PC. Then Byte, PC World, Infoworld and then after only a short pause every combination of the strings: "PC", "World", "Info", "Week", "e-", "Net", "Network", and, um "mation". The content of these publications was every bit as unique and creative as their selection of names, and they all mostly found out that the only way to get a lot of subscribers was to give the things away to just about anyone in the industry. The great scam of convincing advertisers that people actually paid attention to these publications (speaking strictly of the print version here) started screeching to a halt in 2000 (along with a lot of other things) and is in full screech now. Print media in general is suffering from this, but you could question whether this is dissatisfaction with print, versus the general illiteracy of the American public (I vote for the latter, people who don't read newspapers mostly aren't reading anything else ether, like Chancey Gardiner in "Being There" they say "I watch TV"). But for the still literate technophile, the issue isn't the ability to read, it is the preference to get our reading material in a form most convenient for us, where we can cut, paste, comment, e-mail, blog, and so on. No more black ink on your fingers, no more letters to the editor, stamps, piles of kindling, bursting trash bags, etc. I canceled (let expire really) my subscription to Linux Journal about the time of the dust-up with the original staff of Linux Gazette. I also posted comment to the SSC web site where they asked for reaction to this issue. My comments, along with those of others I suspect were negative toward SSC and were soon deleted. Well known columnists for Linux Journal avoided comment on the issue one way or the other, reinforcing my opinion that the whole thing stunk to high heaven. I've since picked up a copy or two of Linux Journal, and as I said, "supported" Tux Magazine, both of which were first class publications in the area they covered. But I had no use for the SSC version of the Gazettte, particularly after they went to the CMS (does anyone even remember what that stands for?) format which was cumbersome at best. Linuxgazette.net though lives on, and (I think) managed to get a complete archive of all earlier editions. You can still get downloaded content via a Debian package as far as I know, but I have been delinquent in following them. I'm going to re-visit all that content and try and start reading the old Gazette like I did Tux Magazine. Maybe I'll even give Linux Journal another try as a subscriber. I live much further from magazine stores that carry them any more, so ad-hoc purchases are pretty rare these days. I hope, in their apparently much humbled state SSC doesn't try and play fast and loose with the Open Source community any longer, I haven't heard any indication that they have. Besides, with the continuing decline in print media, they might not be around much longer. Now it seems only one thing remains for SSC to do to set matters straight, and that is to give back the ".com" version of the domain name to the still active Gazette team. Unless there is a version of the story not yet public, it would seem to be the only right thing to do. Same as last year as I recall (complete with Apple denial). "Fourteen of those missing desktop computers at the Department of Energy's Counterintelligence Directorate were known to hold classified information and the other six 'may have' held classified information, Inspector General Gregory Friedman said in a March report. The government counterintelligence office is in charge of protecting information about nuclear technology from foreign espionage." I get a dose of Infoworld in my Inbox every morning, but don't always find the time to follow up on more than a headline or two. My paper ComputerWorld seems a lot thinner than it used to be too. I send stacks of industry magazines, largely unopened to a extension school teacher who hands them out in his "Intro to DP" class. So, they don't go to waste, but I'm thinking of canceling all paper subscriptions this year anyway. By the time the paper shows up I've read everything of interest, sometimes from several points of view. I have to wonder why more publishers couldn't see this coming, and why, seemingly, some STILL don't see it coming. My theory is that paper publishing has always been a serious con-job. The advertisers had no way to know for certain how many "page-views" his ad got in the paper versions. Sales, keyed to some code that appeared in the paper or a coupon, etc could serve a SOME indication of effectiveness, but then just a few people seeing such an ad could spread the word to dozens who hadn't if it was a really good deal, warping the statistics. Even with cheating, page-views and click-throughs on the web have to be a lot more accurate and can easily be tied to an actual sale (or failure to sell). The jig is up for paper. Somewhere I read that CNet loaded up on floorspace and office furniture just prior to 2000. What were they thinking!? It used to be that there was a clear line of demarcation between enterprise hardware and software and the consumer technology space (talking both pre and post PC era). Now anyone can set up a data-center, and anyone can play journalist and blog about it. So in addition to the meltdown in print journalism, there is a smaller (or is it larger?) flattening of the tech world around plug-and-play consumer devices: Go to web site. Click desired components. Accept suggested network configuration. Proceed to check-out. Your data center will arrive by Fed-Ex tomorrow, or we can launch it for you right now in "the cloud" would you like a free domain name with that? As crude as they were, I'll still miss the old ways. "EMI said almost all of its catalog, excluding music by The Beatles, is included in the deal. Singles and albums free from copy-protection software and with a higher sound quality will be offered as a premium product, the companies announced at a London news conference." Now I've read one story which says the Beatles music is excluded, and one which says it's included. But neither article claims that it is available, nor when it might be. I like the Beatles, but I don't think I'd be interested in owning every bit of it, DRMed or otherwise. In fact I have all the albums I like in the form of CDs and ripped them long ago to play in iTunes, and then my Roku players. I do know people who are compelled to collect ALL of anything they have a passing interest in though, so I guess there is a market. What am I saying? There seems to be a market for just about anything these days. Now if someone just sold doses of good taste. The agreement means that iTunes customers will soon be able to play downloaded songs by the Rolling Stones, Norah Jones, Coldplay and other top-selling artists without the copying restrictions once imposed by their label. EMI said almost all of its catalog, excluding music by The Beatles, is included in the deal.